Here are three things that went wrong with GE's free cash flow and three reasons the stock is a good value. It's no secret that General Electric's (NYSE:GE) free cash flow (FCF) has been a focal point of investor worries in 2018. However, the question now is whether those concerns have been taken too far? There's a case for arguing that GE is being unfairly beaten up regarding its FCF generation, so let's take a closer look at what's going on. Analysts define FCF in different ways, but generally speaking it's the cash left from earnings after working capital and capital expenditures are taken out. In other words, the actual cash that a company has to make acquisitions, or return to investors through share buybacks and dividends. There have been three significant problems for investors with GE's FCF in recent years. GE guides toward industrial FCF -- this includes dividends from GE Capital -- so let's focus on that metric when discussing FCF. First, FCF has been in significantly declining due to the deteriorating power segment. FCF was $9.4 billion in 2015, only to fall to $8.9 billion in 2016, $5.6 billion in 2017, and it's set to come in significantly less than $6 billion in 2018. Second, not only has FCF been in decline, but it's been nowhere near management's guidance. For example, former CEO Jeff Immelt began 2017 predicting $12 billion to $14 billion in FCF only for the company to fall significantly short (see figures above). Immelt was replaced by John Flannery, who began 2018 forecasting $6 billion to $7 billion in FCF only for new CEO Larry Culp to guide the market toward a figure well below that estimate. Missing FCF guidance is frustrating for investors who bought the stock assuming GE would hit its guidance, and it damages confidence in management -- something the equity and bond markets need. The third major issue is that the discrepancy between earnings and FCF in recent years suggests that GE has been making overly optimistic assumptions about earnings from long-term service agreements (LTSA), particularly in the power segment. Simply put, the booked earnings don't appear to be dropping into cash flow, and this is something the SEC is looking into. Clearly, GE has issues, and as its FCF outlook has declined, it's natural that its stock price should fall, too. However, there's reason to believe that the market has taken it too far. First, while it's not clear what GE will generate in terms of FCF for 2018 and guidance hasn't been given for 2019 yet, the company is still generating FCF. For example, the healthcare and aviation businesses are set to earn around $10 billion in profit alone. Some analysts have GE generating around $4.4 billion in FCF in 2018 and then around $4.8 billion in 2019. Note these figures relate to the current portfolio of assets -- I will return to this point shortly. GE's current stock price is around $7.60, giving it a market cap of about $66.6 billion. Based on the estimate of FCF of around $4.8 billion for 2019, GE trades on a forward price-to-FCF ratio of around 14. That's a figure significantly below the current valuations of its peers. GE's cash flow may have disappointed in recent years, but its stock price has discounted much of the bad news already. 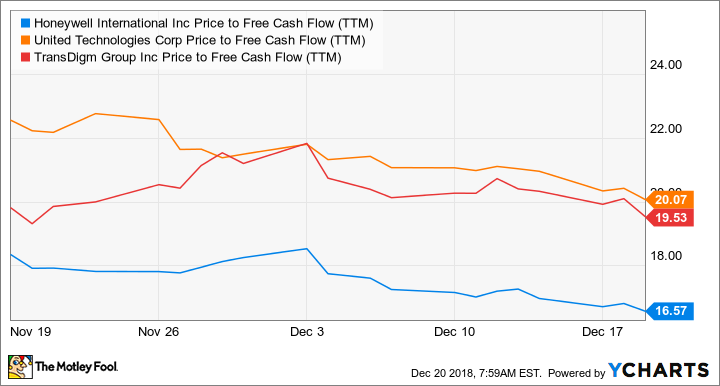 HON Price to Free Cash Flow (TTM) data by YCharts. Second, it's true that the separation of assets like GE Healthcare and GE Transportation, alongside numerous other industrial asset disposals, will reduce the remaining company's ability to generate FCF. Indeed, some analysts have the remaining GE's FCF at just $2.9 billion in 2020. While it's easy to be alarmed at that figure, it's better to focus on the FCF estimate for the current portfolio (in this case, analysts' estimate of $4.8 billion) because investors will receive the benefit of GE Healthcare as a separately traded entity. Third, GE Aviation and GE Power are both going through a period of constrained earnings and cash flow generation. GE Aviation is significantly ramping production of its loss-making LEAP engine -- highly lucrative aftermarket parts and service revenue won't flow meaningfully for a few years. Meanwhile, GE Power is also facing restructuring charges, the blade turbine issue, and other execution issues. In addition, according to analyst research, GE Power has been aggressively discounting the equipment price of its flagship HA large gas turbine in order to generate future service revenue from it. GE Power is also increasing shipments in response to previous orders. When long-cycle industrial companies are in such periods, the market should allow them to trade at a premium in order to reflect the future cash flow coming from the LEAP engine and HA turbine. However, as you can see above, GE actually trades at a significant discount. On a FCF basis, the stock now looks like a good value, so it's time commentators stopped beating the company up over it. However, there's still the difficult problem of GE Capital and the multitude of potential cash calls that the company might need to deal with in the future -- not least tax and insurance liabilities, pension funding requirements, potential SEC fines/charges, and ongoing restructuring activities. That said, if GE can muddle through the period and Culp ends up forecasting 2019 FCF something close to what's outlined above, then the stock will look like a good value. Despite the doom and gloom, GE does actually generate FCF and the stock deserves consideration from investors with a tolerance for risk.